Children and adolescents can suffer from a variety of congenital or acquired foot and ankle disorders leading to pain and/or deformity. The understanding of their pathophysiology and natural history is of paramount importance for proper diagnosis and subsequent treatment. Although management of paediatric foot and ankle disorders is well established, controversies still exist. Moreover, some treatment methods are technically demanding and require special education. 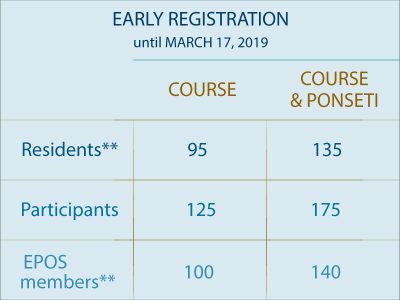 The European Paediatric Orthopaedic Society (EPOS) organizes the EPOS Paediatric Foot and Ankle Disorders Course in order to cover this very interesting area of pediatric orthopedic surgery. The course is aimed at Orthopaedic and Paediatric Orthopaedic Surgeons, Residents and Fellows who want to improve or refresh their knowledge in paediatric ankle and foot disorders. Teaching faculties are composed of internationally recognized experts in children’s orthopedics, with special interest in foot and ankle disorders, from all over Europe. The course includes theoretical lectures, debates, techniques, and case discussions concerning development/growth, anatomy, biomechanics, treatment and complications of congenital or acquired paediatric foot and ankle disorders. Last but not least, the course includes a ‘Clubfoot casting post-course workshop’ to review and to apply the principles of the Ponseti’s casting technique. We warmly invite Orthopaedic and Paediatric – Orthopaedic Surgeons, Residents and Fellows to Thessaloniki, Greece, on 10 – 12 May 2019 at The Met Hotel. We will do our outmost to meet and exceed your expectations! Interested parties can register by filling in the e – Registration Form. Participation is confirmed only upon paying the registration fee and by sending the relevant proof of payment to the Course Secretariat. 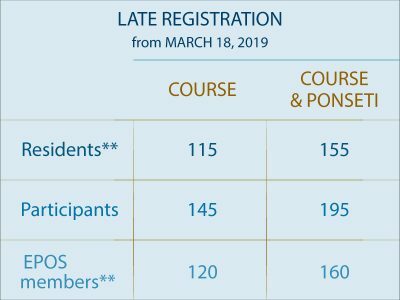 Please note that the registration will be valid provided that the e – Registration Form and the corresponding proof of payment have been sent to the Course Secretariat no later than 26 April 2019. Registrations from 27 April 2019 and after will not be accepted through the website. On – site registration will be possible at the Course Secretariat during the Course. Immediately after submitting the online registration, you will receive an automatic reply to the e – mail address registered in the e – form, confirming the successful submission of your registration. If you do NOT receive this Confirmation e-mail, your registration has NOT been submitted successfully and you will have to re-submit the Registration Form or contact the PCO to have the problem solved. Companies that wish to participate with registration in the Course (individual and / or group), please contact the Course Secretariat directly (no registration form is required) by sending their request via e-mail to: (conference1@premium-events.gr), in order to receive further instructions on the process and the relevant confirmation. Your registration will be completed only until proof of payment is received by the Secretariat. The number of participants is limited to 50 for the PONSETI “hands on” workshop. Registration process will be handled in “first-come, first-served” rule. All bank charges are borne by the depositor. Cancellations by phone are not accepted. In case of a cancellation, the refund will be settled within 30 days after the end of the Course.